The Radiotherapy/Oncology Centre was set up in 1984 and specialises in radiotherapy, haematology, medical oncology and oncologic surgery. There is also a Breast Clinic and a professional palliative care team. In 1995, the UZ Brussel was one of the first clinics worldwide to introduce IMRT in clinical practice and the first European centre to clinically implement sequential tomotherapy. 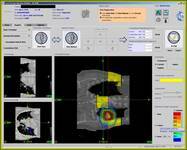 Image-Guided Radiotherapy and Frameless Radiosurgery: "The NOVALIS Project"
The UZ Brussel is world BETA-test centre for the combination of infrared marker technology with X-ray imaging and an Amorphous Silicon detector for on-line target localisation using a robotic treatment couch. The Novalis system is originally designed for intracranial stereotactic radiosurgery, yet where conventional radiosurgery devices are restricted to small (i.e. smaller than 3 cm) intracranial lesions, the NOVALIS system is limited to a 10 x 10 cm2 field size only and not restricted to intracranial applications. 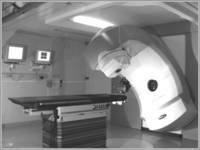 The latter makes it possible to extend the radiosurgery technology to extracranial applications. The NOVALIS BODY project is the result of an intense collaboration between BrainLAB and the UZ Brussel. 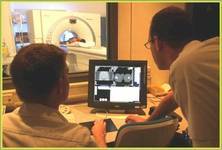 Helical Tomotherapy: "The HiArt Project"
TomoTherapy is a new way to deliver radiation treatment for cancer. TomoTherapy literally means "slice therapy" and gets its name from tomography, or cross-sectional imaging. 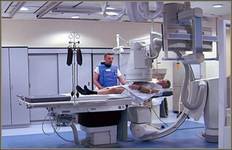 The TomoTherapy Hi-Art System® delivers a very sophisticated form of intensity-modulated radiotherapy (IMRT), and combines treatment planning, CT image-guided patient positioning and treatment delivery into one integrated system.